He worked very hard to become a member of the Special Operations Command and was first a Lieutenant and then a Captain in all the Rescues, Squads and Marine companies. 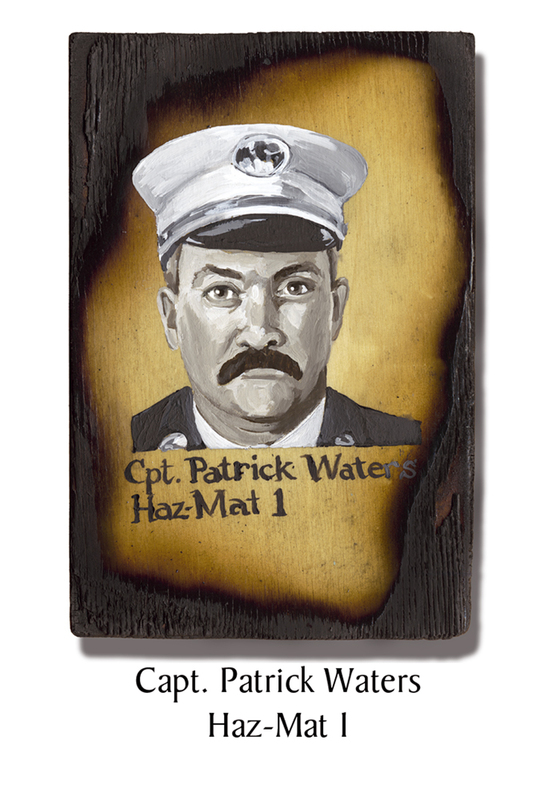 On 9/11, Waters was in command of Haz-Mat 1. He can be briefly seen in the 9/11 film made by the French Naudet brothers as he gets his assignment from the Command Post in Tower One. His remains were found on September 30th. This entry was posted in Better Angels Stories and tagged 343, 9/11, better angels, Dawn Siebel, FDNY, firefighter, firefighters, firefighters of 9/11, Haz-Mat 1, LODD, Manhattan, memorial, NFFF, paintings, Patrick Waters, portraits, World Trade Center, WTC. Bookmark the permalink.